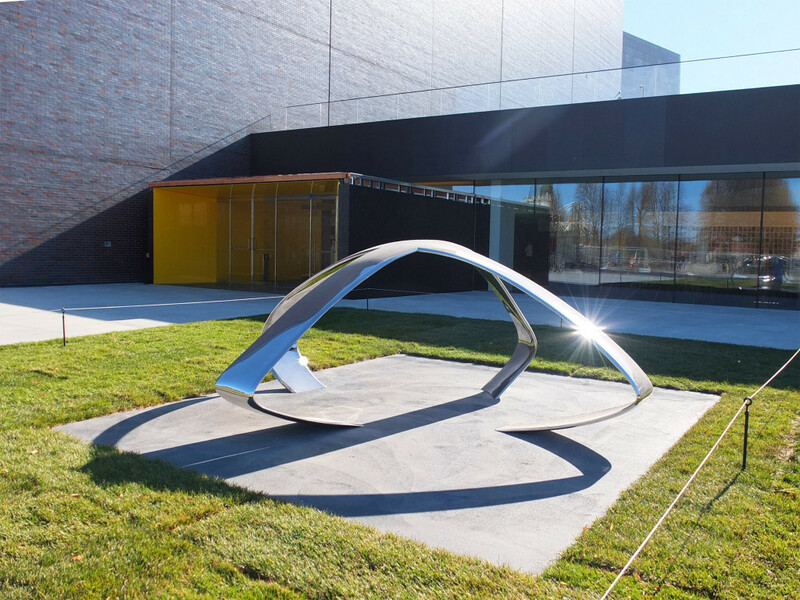 To commemorate today’s opening of the Walker’s new Vineland Place entrance, Visual Arts curator Pavel Pyś talks with Los Angeles–based artist Liz Larner about X (2013), the gleaming stainless steel sculpture that welcomes visitors. Working with abstract and geometric forms, Larner has consistently explored the possibilities of sculpture, and in particular the relationship between solid mass and volume. Oscillating between the two- and three-dimensional, between drawing and sculpture, Larner’s works draw attention to the relationship between ourselves and the surrounding environment. Pavel Pyś: Throughout your practice you’ve worked with a variety of materials, ranging from traditional ones, such as clay, steel, copper, and bronze, through to unstable ones, like champagne, caviar, and sour cream. How do you choose the materials you work with? Liz Larner: That’s a great place to start. I really feel that material gives a sense of understanding and that it’s always a part of it. I choose materials by their significance, either playing a part in actual applications in the form or in terms of an attitude. So I use it for both, kind of. The same material can function for both. But that doesn’t always happen. The material is how we receive the content, the vehicle for the reception, a lot of times. And so it’s a part of it. I want that part of it to play a significant role in terms of how you understand the sculpture, whether it be the subject or the form or in-between those things. Pyś: You mentioned that the material carries the content and the conceptual meaning. How does your experience differ when you have the material right to your hand and can touch it versus starting with the work that you can’t touch when you’re making it, for example as a rendering? Larner: I think that has changed over time. For me, it has almost happened in reverse. I’m now at a point where I really want to have my hand be in the work, which might be part of the reason why I’ve moved to clay. When I started out, it was a more conceptual approach to “what materials are these?” I’ve always been interested in the difference between what something is called and what something is and how we receive it. I guess that was what was more important to me in the beginning, and it was almost some of the linguistic and somatic kind of interactions that the material produces. Now I find any individual hand very interesting. I think it’s something that we haven’t seen as much of recently; he digital has really changed that. In a way it’s more exciting to have a hand up against the digital in these times, when most objects that we encounter have some kind of digital aspect to their making. Pyś: When we think of sculpture, we usually think of solidity, mass, and sculpture being stable. However throughout your work—and this is also the case with X (2013)—there is a relationship in the work between volume and density. Looking across your practice, there is a consistent interest in how to achieve a sense of volume without a lot of stable, solid material. Larner: Yes. I think that there’s so much there historically in the way that modernism ended. The beginning of postmodernism began, I think, in the late ‘60s with minimalism and post-minimalism. There was a kind of agreement a lot of times, and I think it was seen as the truth to the materials that mostly sculptors and specific object makers were abiding by. A lot of the current industrial methods were being used in sculpture. Though I think they were not interested in illusion, and so I feel that it kept them very true to the mass and density of the material. I looked at that a lot when I was thinking about making sculpture. And ways of changing those relationships between the mass and the volume, or the density and the mass, or the density and the mass and the volume, became something that I sense. Just even seeing a volume at that size, that isn’t made to seem like a solid or is a solid, kind of puts your senses on notice to look more intensely and explore the space of the sculpture and the sculpture itself more intently. I think it intensifies the reception because there’s the sense that it may not be real even though it obviously is real. Pyś: The line has played a key place in your practice, and indeed X looks a bit like a drawing that has been pulled and pinched and moved into space. How important is drawing to your practice? Larner: The two-dimensional is important to me. I do make drawings, and I make a lot of drawings in preparation for sculptures. And I make a lot of models. But drawing is not a primary part of my practice. For me, the kind of blurring of the distinctions between the two-dimensional and the three-dimensional has been something that I’ve been trying to do for a long time, and that’s kind of where drawing comes in. And it has come in in many different ways. Pyś: You talked a little bit about the relationship to material and the digital. X was entirely computer-generated. How did you conceive of the work, as you were working with computer imagery? Larner: Well, I had already made a form on the computer, a model. I wanted to use that form and sort of destabilize it or make it even less readable by imposing “X” over it, and then deleting that amount of form that was in those empty spaces. So “X” took on that form, without relaying the rest of it but just giving a partial aspect of it. That was done digitally as well. Pyś: How does that shift your approach to the work? I imagine that when you have access to something that’s right at your hands, such as a pen and paper, then there is a certain immediacy. How does that sense of immediacy shift when you’re working with something that’s on the computer screen? Larner: It’s not that immediate. I mean, it’s very immediate, in the sense that you can do things quickly, and you can do things that you can’t do by hand. So it’s a really good tool for mocking up. But in the end, it’s so different because you’re still not seeing the same thing that you’re going to have. It’s a much different kind of experience to try to make something from the ground or by hand than to have the computer to relay something, and you have to give over to it. Then what happens is when you get it to the stage of making the thing from all of this computer information, you see what you’ve got, so in a weird way, although it has been very clearly rendered, still it’s the spatiality of it in a real space that shows you what you have. So there’s an area of not knowing. Even though it clearly spells it out while you’re making it, you can’t really—as a sculpture, it can’t truly be imagined even though these tools are so powerful that you can move things around and look at them from many angles and simulate surfaces. Pyś: The version of X in our collection is made of mirror polished stainless steel. 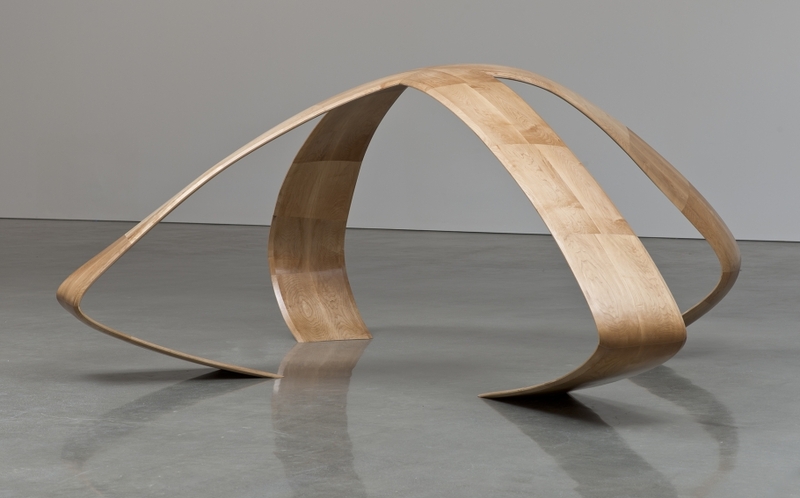 In 2013, you showed another version of the sculpture, made of maple, at the University of Texas. How would you describe the difference in experiencing these two materially very different works? Larner: It goes back to your first question. It was absolutely interesting for me to see the same form in the final scale in the two materials because they have such a completely different feeling to them. The one in maple is warm and inviting, and it served to let me experience the form in full scale. I think that one of the things about X that’s important to me is that one can be inside the sculpture which we’re talking about, about not having the full mass with the volume, you know, being able to enter into the space of the sculpture and be in the middle of it. That’s something that the experience in the maple is—I mean, the wood is warm and kind of golden, there’s a sense of stability in that and it gives you a completely other feeling than the bright, hard, reflective, fast-moving surface of the stainless steel. So it couldn’t be more different even though they’re the same form. Pyś: Would you consider the maple X a model or an independent, separate work? Larner: I wanted to make it in another material. I didn’t want to go directly full-scale into the stainless steel. 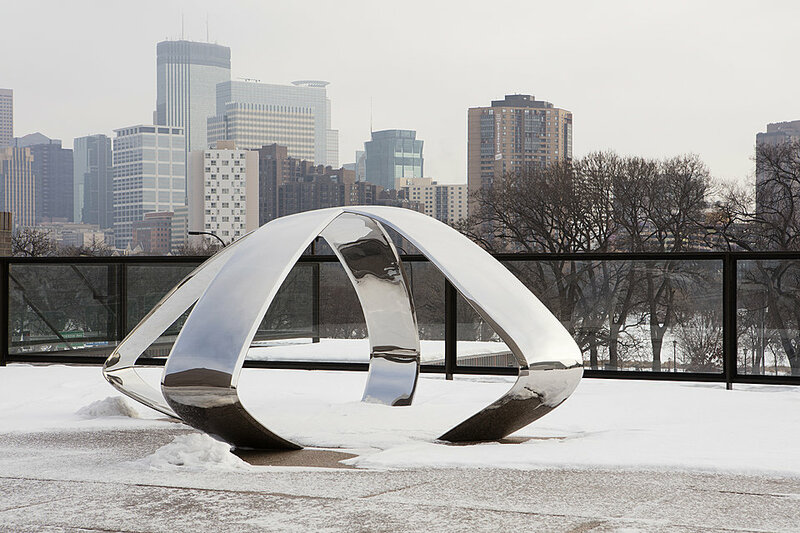 Stainless steel was a huge commitment; there needed to be something that was in another material so that I could see the form. So I decided to do it in maple and thought that it would be interesting to see the two different materials. But the main reason was simply to have another material that wasn’t quite as extreme in all ways as the stainless steel before I committed to that. But it’s a piece on its own. I don’t think of it now as a model, even though it served that purpose in the kind of trajectory of which piece I made first. Pyś: I want to ask you about “X” as a glyph, which recurs throughout your work as a sign of potential of the unknown, as you mentioned before. How did you arrive at this particular character or glyph? 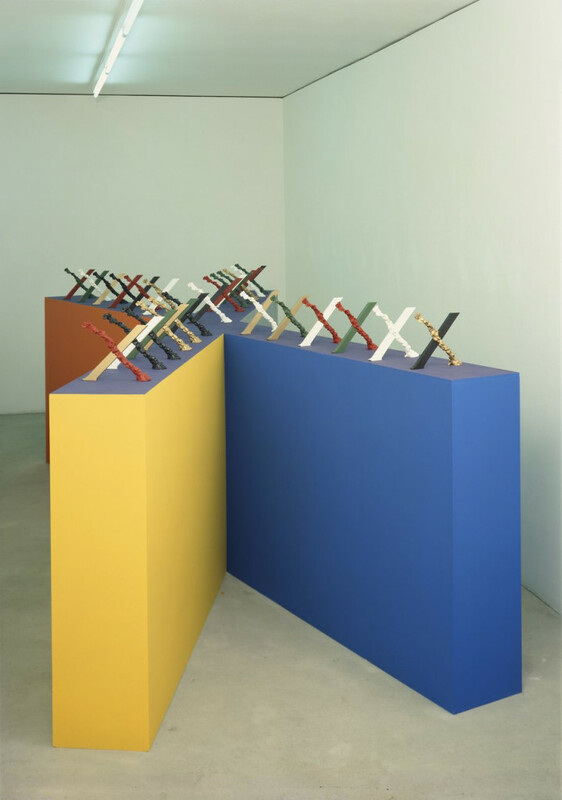 Larner: Well, Variable (1990) was the first piece that I did, which was an addition of an “X” that has two very different sides and, I think, five different colors that went throughout, so it’d mostly be different colors on different sides. It’s a mathematical idea of a variable. It’s such a great idea, the simple graphic form can contain anything. It’s illimitable. I felt like that’s such a usable form for a series of sculptures, because I think it allows an abstract sculptor, to be able to have a motif that changes– use it as a variable but in a sculptural way. Each time I do it, it has a different trajectory, I think, it’s going in a different direction, and can be something else.